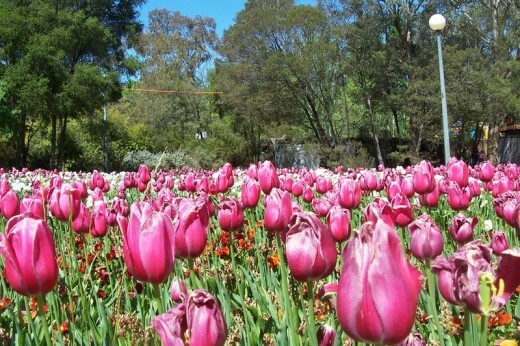 Here are some selected pictures of tulips from Floriade at Canberra's Commonwealth Park. 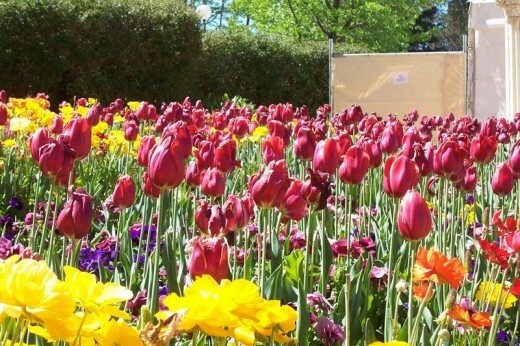 Floriade is Australia's premier spring festival and a world-class floral spectacular. 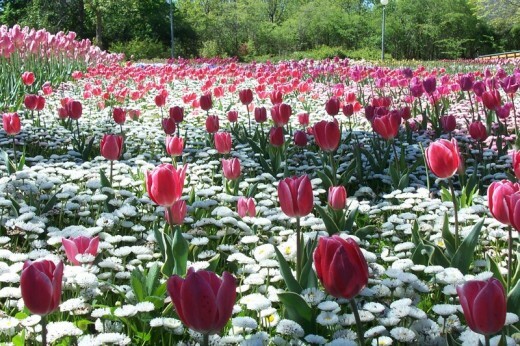 Every year this park is is transformed into a tapestry of color with more than a million bulbs and annuals in bloom. 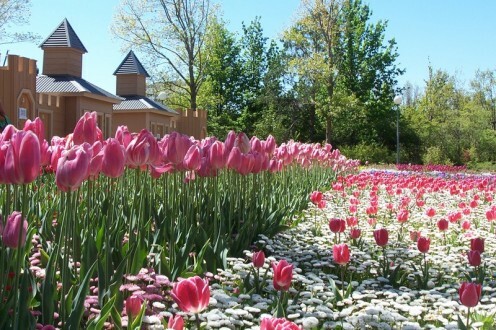 Floriade runs for one month from mid September to mid October and attracts hundreds of thousands of visitors each year. 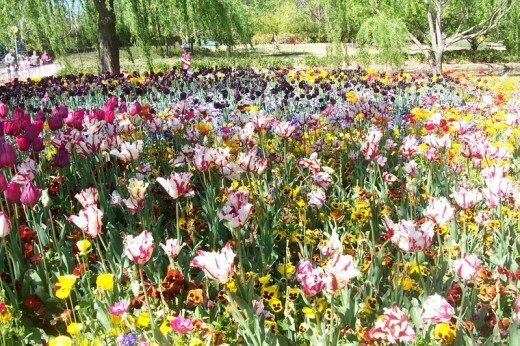 If you are planning to visit Australia during September or October make sure you don't miss Canberra's famous Floriade. 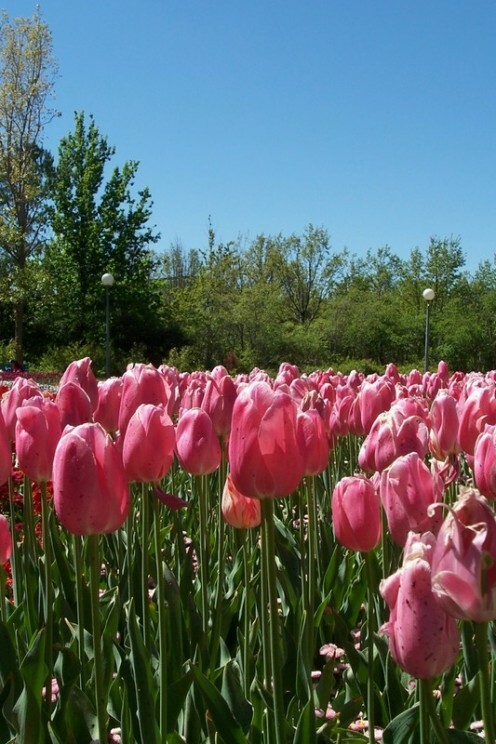 Tulips are perennial bulbous plants growing to 10-70 centimetres or 4-27 inches tall, with a small number of strap-shaped, waxy-textured, usually glaucous green leaves. and large flowers with six petals. 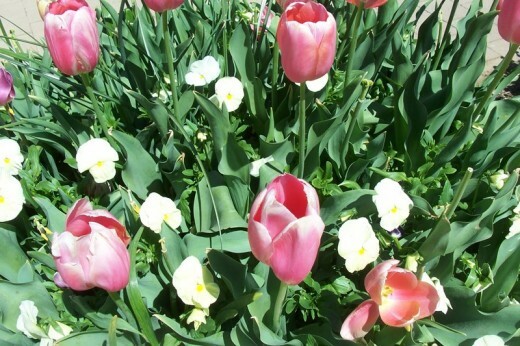 Tulip is a genus of about 100 species of flowering plants in the family Liliaceae. 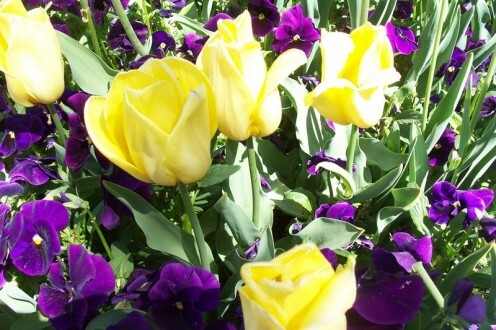 Tulips provide a vibrant display of color. 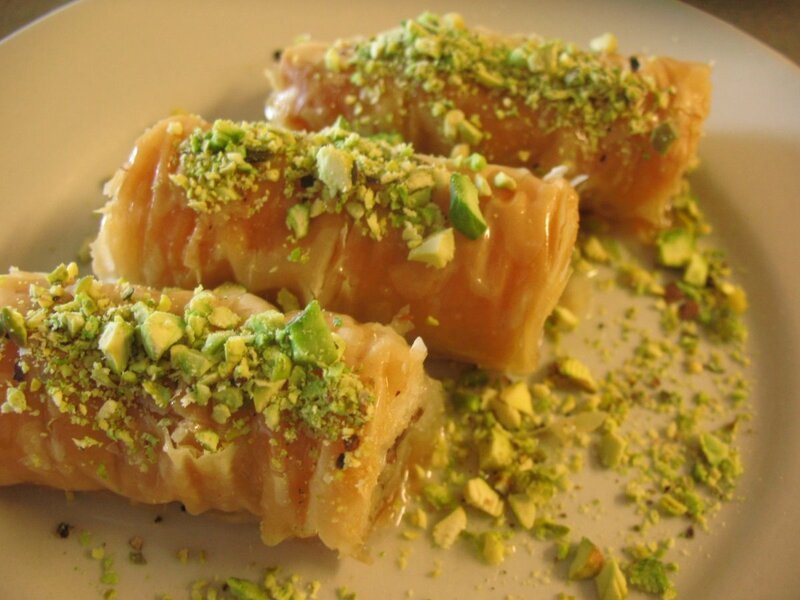 In the 16th Century they were brought to Holland from Turkey and quickly became widely popular. Today Tulips are cultivated in Holland in great numbers and in huge fields. Dutch tulips are exported all around the world that is why people thinks that it originated from Holland. 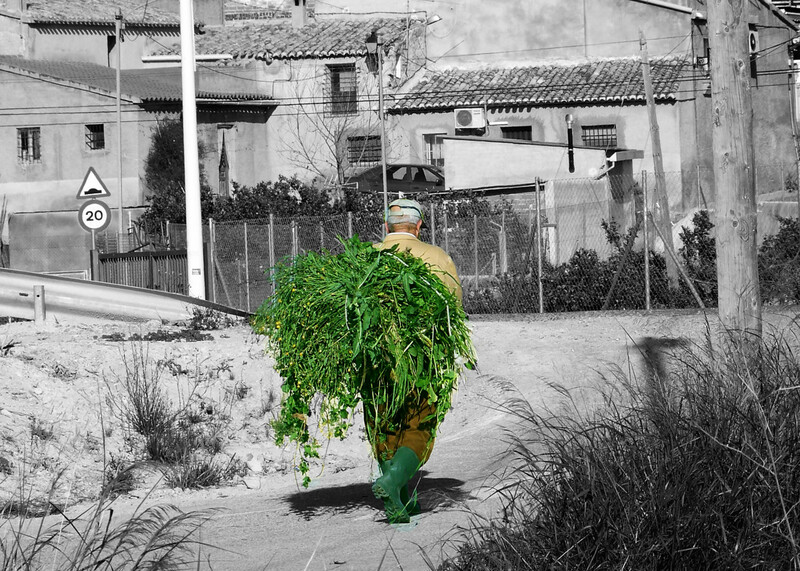 Many cultivated varieties were widely grown in Turkey long before they were introduced to European gardens. The flower was introduced in Western Europe and the Netherlands in the 17th century by Carolus Clusius, a famous biologist from Vienna. Carolus Clusius received some bulbs from his friend, Ogier de Busbecq, the Ambassador to Constantinople (presently Istanbul). 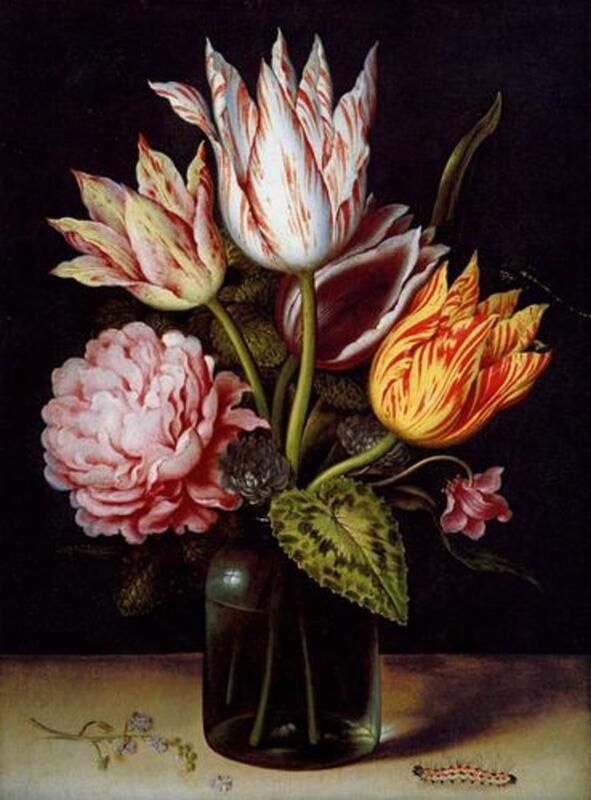 He had seen the beautiful flower growing in the palace gardens and sent a few to Clusius for his garden in Leiden. He planted them and this was the beginning of the amazing bulb fields we see today. 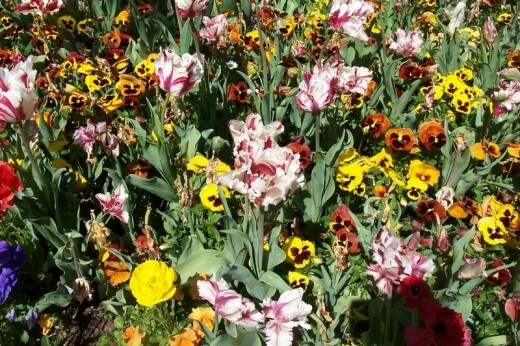 In the 17th century the overgrown interest and high popularity of Tulips brought the so called "Tulipmania" in Holland. 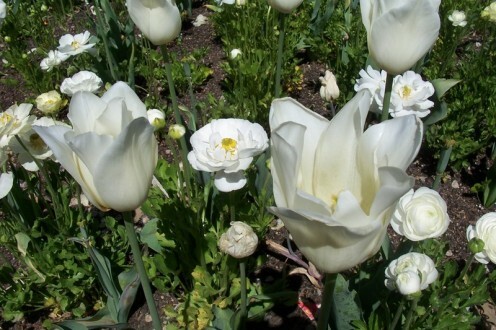 In 1637 bulbs were highly praised and prices gone up day by day reaching extraordinary numbers. Bulbs were sold by weight, usually while they were still in the ground. Some examples could cost more than a house at this time. Over-supply led to lower prices and dealers went bankrupt and many people lost their savings because of the trade and the tulip market crashed. 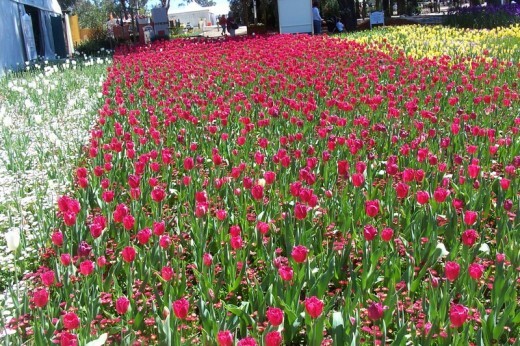 Tulips played an interesting role, in the Turkish history. 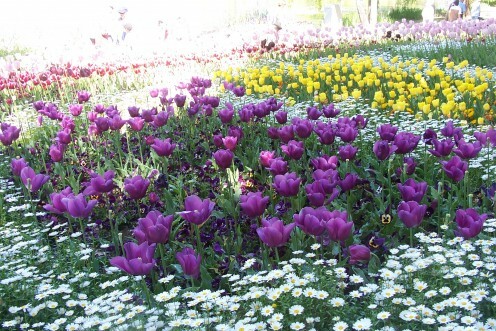 The period in between 1718-1730 is called as the "Tulip Era", under the reign of sultan Ahmed III. 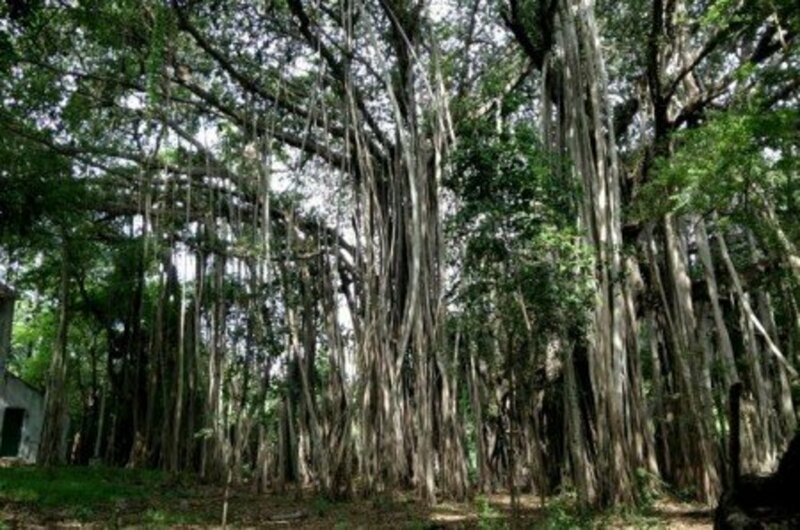 This period is also expressed as an era of peace and enjoyment. Tulips became and important style of life within the arts, folklore and the daily life. Many embroidery and textile clothing handmade by woman, carpets, tiles, miniatures had tulip designs or shapes. 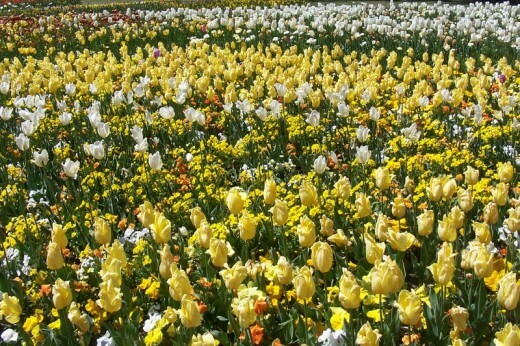 Large tulip gardens around the Golden Horn were frequented by the rich and elite people. The Tulip Era was brought to an end after the Patrona Halil revolt in 1730, ending with the de-thronation of the Sultan. The botanical name for tulips, Tulipa, is derived from the Turkish word "tulbend" or "turban", which the flower resembles. It's considered as the King of Bulbs. Tulip (Tulipa) is the national flower of Turkey, Holland (The Netherlands) and Hungary. Bougainvilleas are evergreen woody semi-vines with thorns, with masses of papery, petal-like bracts which surround tiny, tubular white flowers. Frangipanis also known by their botanic name Plumeria . It has romantic fragrance and a choice of beautiful warm tropical colors. Chrysanthemums were grown for thousands of years in Asia, but they were not widely known in the rest of the world until early 19th century, when plants were imported and hybridized in the UK. Just purchased tulips at a great price but I don't know how to keep them over the winter - our ground is now frozen. Am I outta luck? Was I the sucker trying to save money? all pictures are magnificent ...I wish I could go to either Turkey or Holland to witness all the beautiful landscapes with tulips . I have always loved tulips. Stunning hub! Thank you. Absolutely beautiful! Great pics. I especially like photos 1, 2 and 4. The pictures are beautiful especially the first one. 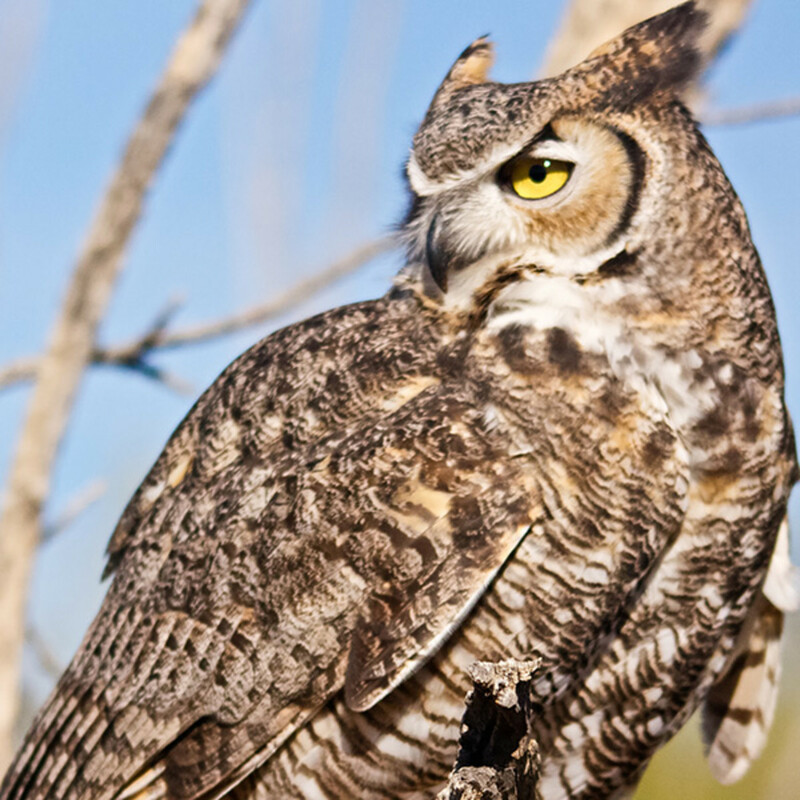 WOw, I love ur photos. Flowers r amazing. I loved your pictures, I was in Amsterdam last year at the start of spring and colorful tulips brightened the still cold and grey days. Wonderful images, I love the Floriade, it is a great tapestry for photography and I did such a work myself, unfortunately I no longer have the pictures, silly me. 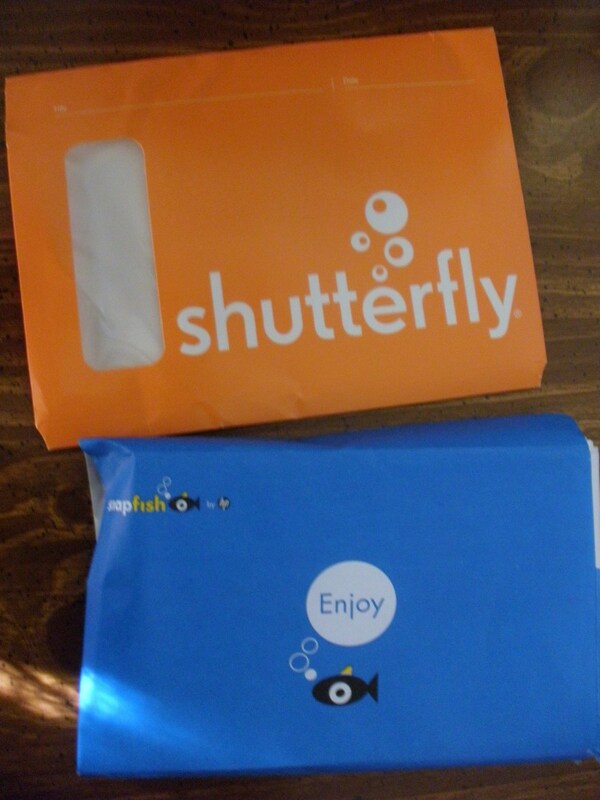 I enjoyed your hub and the pictures of the tulips. Wish I could grow tulips like that.